Alabang West, Revel the glitz and glamour of a Hollywood Lifestyle. Beverly Hills’ chic and glamour can now be found in Manila. Alabang West is the latest distinctive landmark development from the fusion of expertise of Megaworld Corporation and Global Estates Resorts Inc. Megaworld Corporation is recognized as a leading developer of fully-integrated masterplanned communities while Global Estates Resorts Inc. is known for their unique capabilities in creating projects that centers on tourism and leisure. Megaworld Global Estates Inc. – South distinguish its brand by developing creative and innovative building ideas to lavish its clients with comfort and surprise them with fresh ideas. 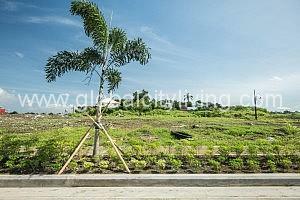 It is strategically located at Alabang’s high end communities and golf course. The posh Beverly Hills inspired neighborhood comes with a world-class shopping strip, called Rodeo Drive. It is designed to be the newest commercial and business hub in the South, where people can fuel their passion to fashion, leisure and business along the 1.3 kilometer commercial and business trip. A lifestyle fit for glamorous living. Also have an iconic address with a Beverly Hills-inspired street names. The property’s street architectural display of an old world cobblestones and street lamps, together with towering palm trees- place of sophistication, luxury and exceptional service. The 6,800 sqm, two-storey clubhouse will be equipped with a collection of carefully planned conveniences intended to answer the various needs of its residents. The township has 61 hectare total land area with 785 lots ranging from 244 to 795 square meters. Strategically located near schools, hospitals, business and leisure developments such as Paref Woodrose, San Beda College-Alabang, Dela Salle Santiago Zobel, Asian Hospital, Southlinks Golf Club, Alabang Golf and Country Club, Alabang Town Center and Festival Mall. Alabang West is also nestled at the heart of Alabang’s high-end communities and golf course with modern features that are incomparable to the rest. Alabang West is conveniently accessible through major access points such as SLEX-Alabang Exit, Filinvest Exit and the upcoming Daang Hari Exit. Its close proximity will let you move around the Metro within minutes and easily access major Central Business Districts such as Makati and Taguig. Turnover Balance with Megaworld can be Bank Financed!